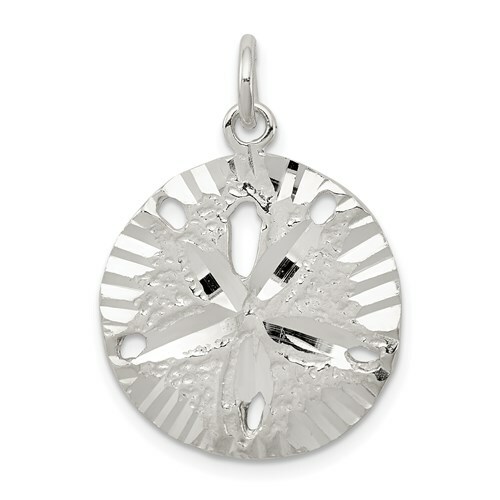 This round sand dollar charm is made of polished sterling silver. Item size: 3/4 inch tall by 3/4 inch wide. Weight: 2.5 grams. Jump ring fits up to a 3mm wide chain. Made in USA. Perfect size. Sets perfect when I wear it. Many compliments on how real it looks even though it is silver.I dearly love it. I love all the pieces my husband purchased from Joy Jewelers. I called them when I got the jewelry and the gentleman was nice and considerate and helped me tremendously. I would but again from such a great company!